Tim Owens and I went down to Virginia Commonwealth University’s ALT Lab to catch up with Tom Woodward, Jon Becker, and a recent, most impressive addition Mark Luetke. They have been doing some great work with their WordPress Multisite (WPMS) instance Rampages. They have brought on more than 7,000 users in just over a year, which is pretty astonishing. One of the things we talked about is the cool work Mark has been doing over the last couple of months for their blogging platform, namely writing awesome plugins. 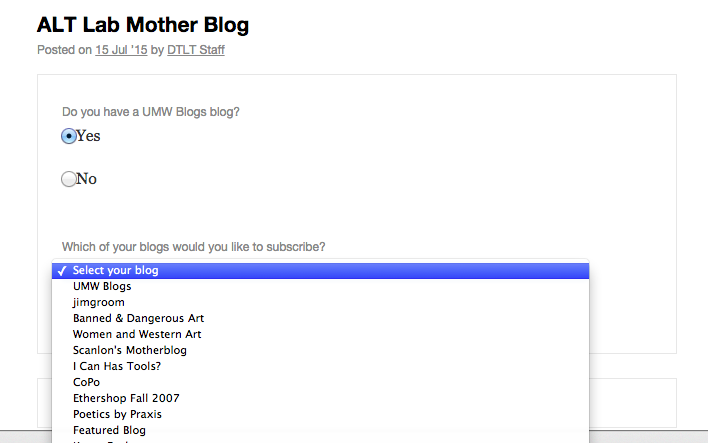 One that hit close to my own heart is the “Mother Blogs Made Easier” plugin that works in conjunction with FeedWordPress and allows faculty to specify a category that will syndicate into their course site. This is a bit of shortcode that a faculty can add to a page or post. Once they do it becomes a straightforward form that a student fills out and then the category a faculty member added is seamlessly created on the student’s site as well as added to FeedWordPress on the Mother Blog (the course site that aggregates in all the students posts). 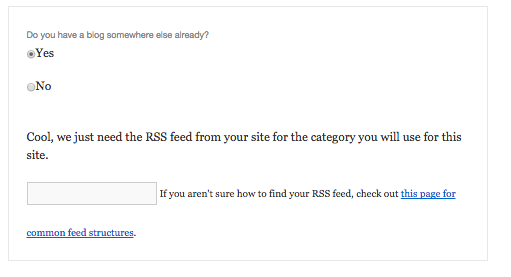 Above is the post or page with the shortcode, as you can see it is a simple yes or no to whether you have a blog on the system. After that you choose the site for this course, you’ll notice it slickly includes all the sites one has on a given WPMS instance. After that you are all set. If you don’t have a site, the form branches and asks you if you want one, and then sends you to create a site. On the other side, this plugin not only creates the category on the student’s blog, but also adds it to FeedWordpress with the proper category feed. 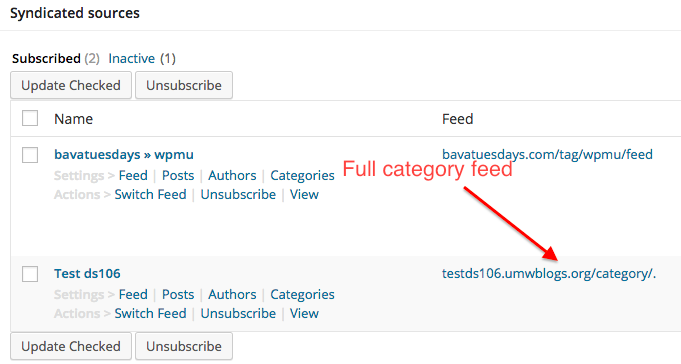 So, when I added testds106.umwblogs.org to the form, this plugin automatically added testds106.umwblogs.org/category/ds106/feed -how awesome is that? 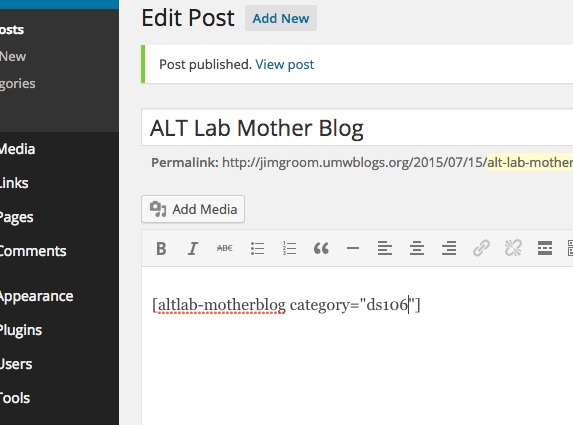 This entry was posted in WordPress and tagged aggregation, altlab, feed, motherblogs, plugins, syndication, wpms, wpmu. Bookmark the permalink. Yeah, this is a pretty awesome plugin, and it works solid. However, this doesn;t necessarily work for a domains setup because in order to create a category on their site they need to be within a common WordPress Multisite (or a network of sites on your own domain). So, in other words, student most have blogs on a multisite, not their own blogs, for the proper categories to be created for them. I think this plugin could be abstracted out pretty easily to work better with domains, and if Mark is feeling charitable, maybe he will play with that. Thanks for this post! I gave it a quick read and then linked out to check out Mark Luetke’s site. The next think I know, I’m following a link from his site back to Martha Burtis’ site to download her remote comments plugin. And now we have some comment counts showing up on prisoner106.us. Glad you tried that out and got it working. That will be my next post. Also, the prisoner106.us site is gorgeous. Fine work. Getting remote comments working led me towards another modification which was to explore some of @cogdog‘s Feed WordPress 101 writings around the use of the Feedwordpress Advanced Filters plugin, the Auto Post Thumbnail plugin, and the FWP+: Add Attribution plugin. I had to go back and manually re-syndicate most of the posts to get the images downloaded so that they would be available locally for use as Thumbnails. Even after that, I’ve had to attach a few of them manually. However, it seems to work automatically for new posts. Right now, there’s only one 1 user and 1 blog in the site. Sorry for posting a help request here, but if you have any quick insights into how to resolve this, I’d be grateful. I just installed FeedWordPress and the plugin on a brand new multi install (vagrant and vvv) and couldn’t replicate the problem you are getting. Also there are some rather important updates you’ll want anyways. You rule! Hope this helps John.